We make easy-to-use tools for first responders. Access 911 computer aided dispatch information on patrol and increase your situational awareness with our integrated GPS fleet tracking. Locate all units with live GPS tracking. Color-coded units show who is busy, en route, or available. View live updating 911-call information direct from your CAD system. Seamlessly share data between multiple agencies. Search national, state and local crime databases for vehicles, subjects and articles. Automatically search multiple federal, state, and local databases at the same time. Type your search query in a single field, and we'll figure out what you're searching for. Our SMS-based two-factor authentication adds another layer of security. From FIPS 140-2 encryption to transaction logs, ensure compliant access to CJIS data. 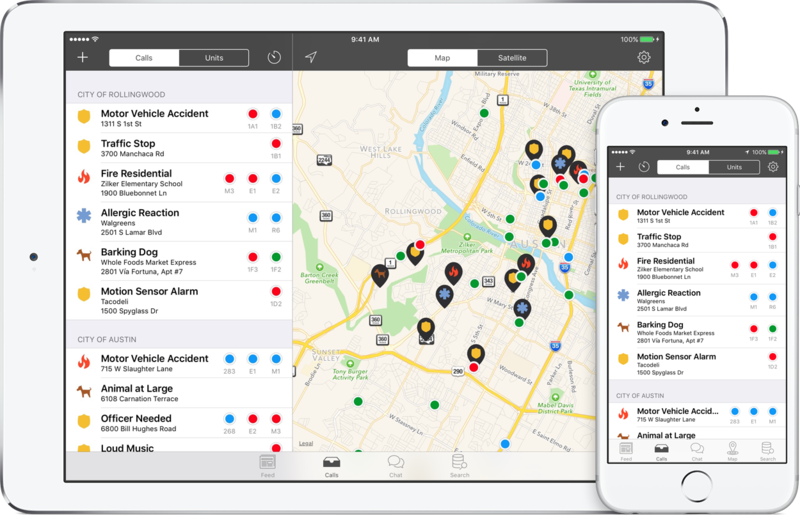 Share critical information with other emergency responders and get alerts and notifications from your fleet. Easily organize your agency's communication into channels. Share PDFs, photos, documents, spreadsheets, and more securely.